In this verdant garden oasis, a counterpart to the open air Sunlight and Shadow painted a few years earlier, William Merritt Chase presents an autobiographical glimpse into his life as a newlywed and father. 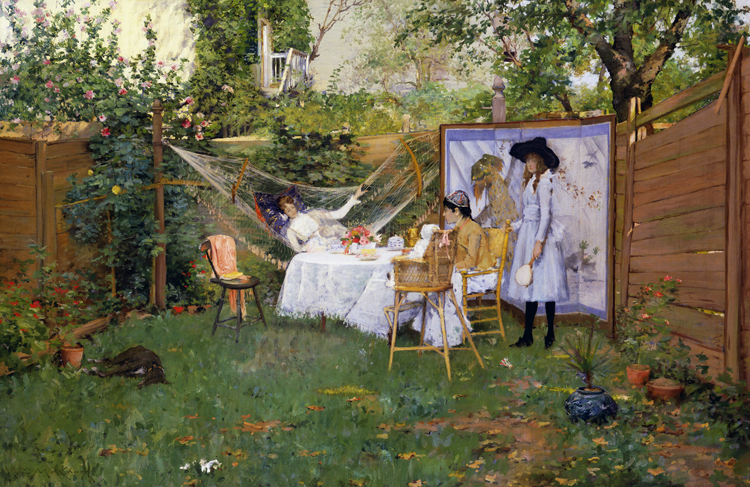 The painting is set in the backyard of Chase’s parents’ Marcy Avenue home in Brooklyn, where he and his wife had moved in 1887 in anticipation of the birth of their first child, Alice (“Cosy”). Chase’s wife appears seated at the table beside baby Cosy in the high chair. Standing in front of the screen is Chase’s sister Hattie; Chase’s sister-in-law Virginia lounges in the hammock. In a manner akin to his studio ensembles, Chase builds up the scene through color harmonies, layered surfaces, vibrant brushwork, and an array of objects and accessories from both the West and East: the Spanish shawl draped on the empty chair, the Japanese screen and cap, and the Dutch 17th-century hat. That Chase kept this painting until his death is testimony to its special meaning for him. This entry was posted in Experiment Station and tagged artist families, artist life, backyards, breakfast, family, hammocks, William Merritt Chase. Bookmark the permalink. For a mystery novel in progress: Do you know if the Toledo Museum of Art still owns this painting? Does it hang there on display? The Toledo Museum of Art does still own this painting (a little bit more about it and its history here: http://emuseum.toledomuseum.org:8080/emuseum/objects/54971/the-open-air-breakfast?ctx=28b55d09-46ac-468b-b502-0d205c84e8bf&idx=1), but I don’t know of the loan or storage schedule planned for the painting regarding whether it’s on view now, or when it will be if it’s not currently. You’re best bet is to get in touch with them directly, they should have a fairly quick answer for you. I hope this helps, and very best of luck on the mystery novel!